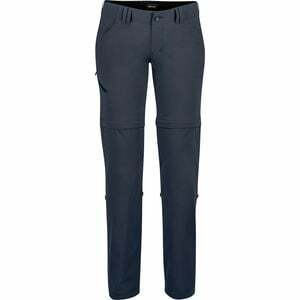 Product Condition: The Lobo's Convertible Pant - Women's is in Excellent condition. These pants were previously owned for three weeks. The following observations were made regarding these item. *They were tried on in indoors for an occasion. *There aren't any defects in them at all. *They got minor pet hair/lint, cleanable. *All items sold as is, all warranties void. While it may be impossible to pinpoint the exact cause, there's something about backpacking through an alpine climate that makes you sweat in the strangest of places. So when your gams start to drip salty perspiration faster than you can wring out a washcloth, just zip off the leg bottoms of your Marmot Women's Lobo's Convertible Pant and you'll be good as gold. Designed specifically for hiking, backpacking, and mountain adventures, the Lobo's feature lightweight and quick-drying fabric that keeps you cool and comfortable throughout your excursions while UPF protection and a DWR treatment give these pantalones a little extra boost in protection against the elements. The Lobo's are equipped with a gusseted crotch that won't impede mobility and a roll-up feature that makes for easy body temperature regulation in the event that you need a little breeze.